Often times, it will take me a solid hour to decide what to bake when it’s baking time. I am extremely indecisive, and when there are so many wonderful recipes to choose from, how do I pick the one? Obviously the world will still go on if I pick a dud, but I always want to make just the perfect thing for the time. 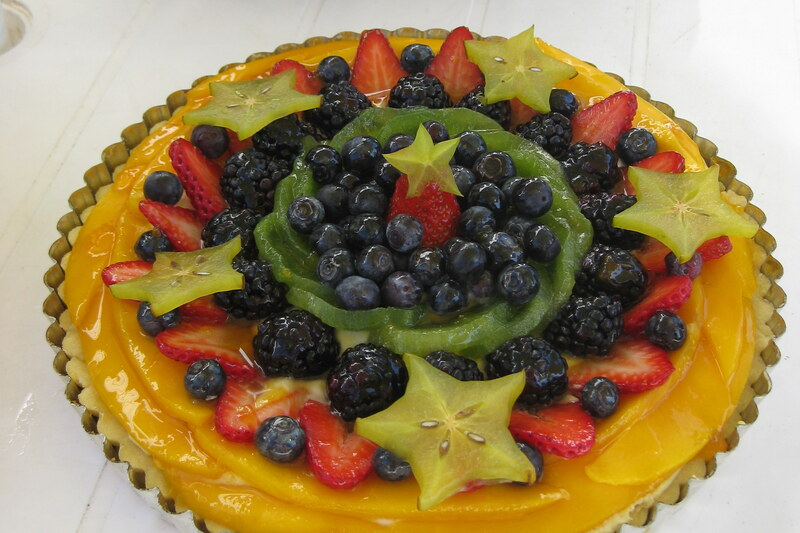 This Easter was an exception to that trend — five minutes into the search, I saw a picture of a fruit tart and I was sold. The pastry cream was completely untraditional — it didn’t have you adding the dairy into the cooked cream base, but instead chilling it (just the cooked yolk and sugar mixture) then adding the cream once it was whipped to stiff peaks, creating a texture much closer to whipped cream and less similar to a custard. It seemed springy to me, and the opportunity to pick and choose the fruits to adorn the top gave me some creative liberties, plus it would be visually impressive. My mom had just bought the newest issue of Cooks Illustrated, which had a fruit tart recipe in it as well, so I used the crust recipe from that (a pate sucree — my first attempt at making this type of sweet tart dough), and then used the whipped pastry cream filling, and a secret layer of ganache to assemble the tart. I went to the supermarket with the intent of buying at least a variety of berries, and then whatever other fruits looked fresh and ripe. Strawberries and blueberries were on sale, plus those make for the best decorating, so I picked those up as well as a Mexican Mango, a few very ripe kiwis, a star fruit, and some jumbo-sized blackberries. The colors, shapes, and textures of all the different fruits complimented each other nicely, and made for a fun eating experience. The flavors were all very different — the mango was a bit tropical, the strawberries an instant reminder of summer, and the blackberries a bit tart — so very yummy, and quite the adventure for your palate. Plus it just made for the most beautiful presentation. It was classy and elegant (but also peppy and fun), and so very pretty for the amount of work that it took. 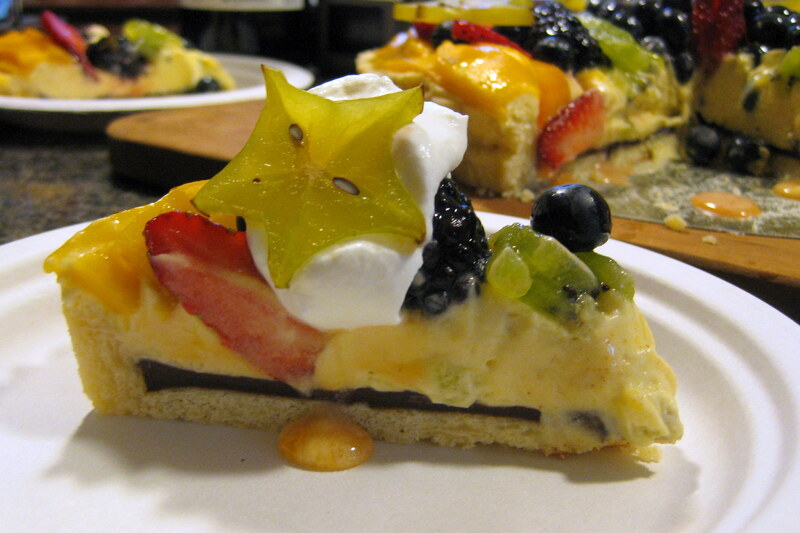 Fruit tarts are one of those desserts that seem to me to be much easier to assemble than they appear. It’s quite the trick to have up your sleeve! Perhaps the best part about this tart isn’t visible at first, but once you cut into it you can see. There’s this little line of dark chocolate ganache coating the bottom of the tart shell, creating another visually appealing aspect once the tart is sliced, but also providing just another element of flavor, and as Emeril would say, it really “kicks it up a notch”. The tart has everything — creamy, crunchy, tartness, sweetness — all it’s missing is that little bit of depth in flavor, and the dark chocolate ganache provides just that. It is the perfect spring (or summer) dessert, and one that I’m quite certain will please anyone. Plus it’s so much fun to make, and it allows you to express your creative side. 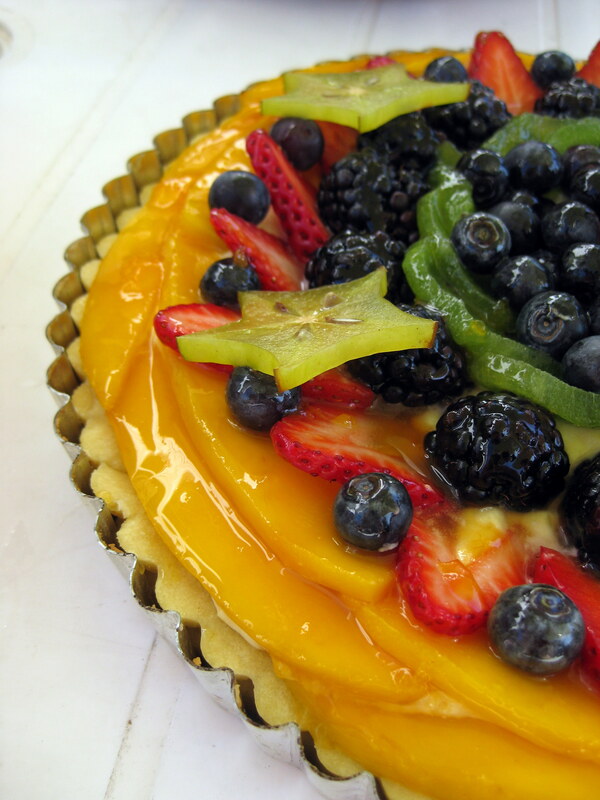 You could make it an all-berry tart, or a tropical tart (that’s next on the list — focusing on mango, pineapple, coconut, and kiwi with white chocolate) — the options are many. 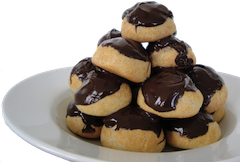 Not many desserts can be so versatile, but also so delicious and fun to make.